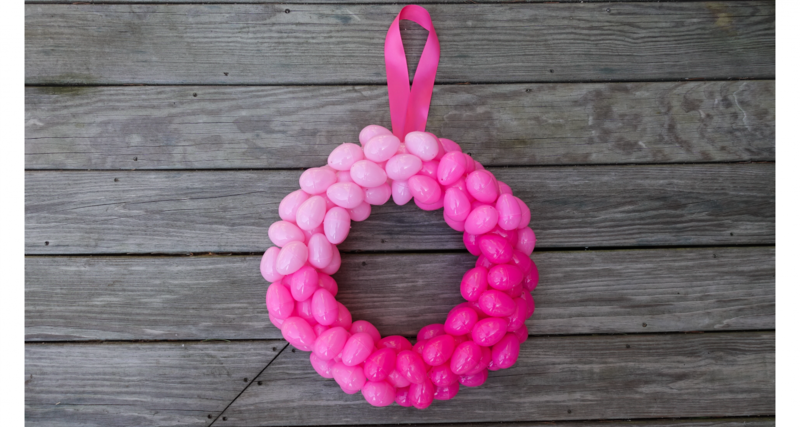 This ombre Easter Egg wreath turned out even better than I expected. 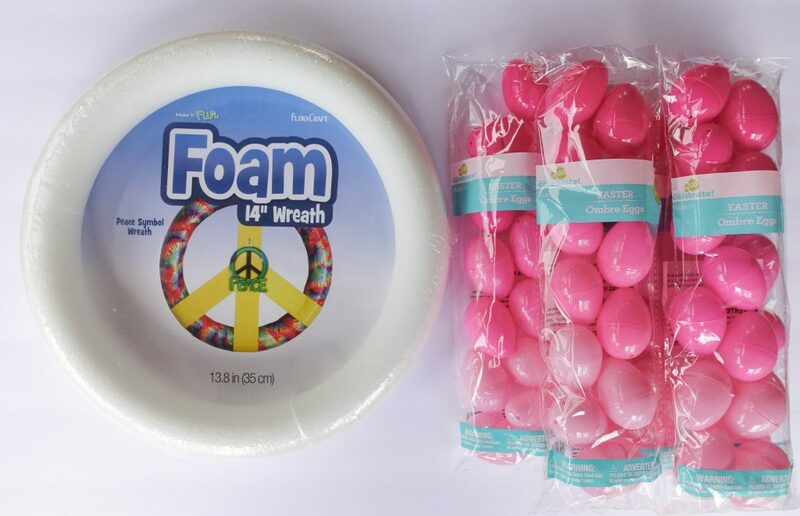 With just a few supplies that we picked up from our local Walmart, we created this quick and easy Easter decoration that brightens up the room. The kids were able to help sort the eggs by color and hand me the next one up, but because of the hot temperature of the glue gun, I did all of the gluing myself. 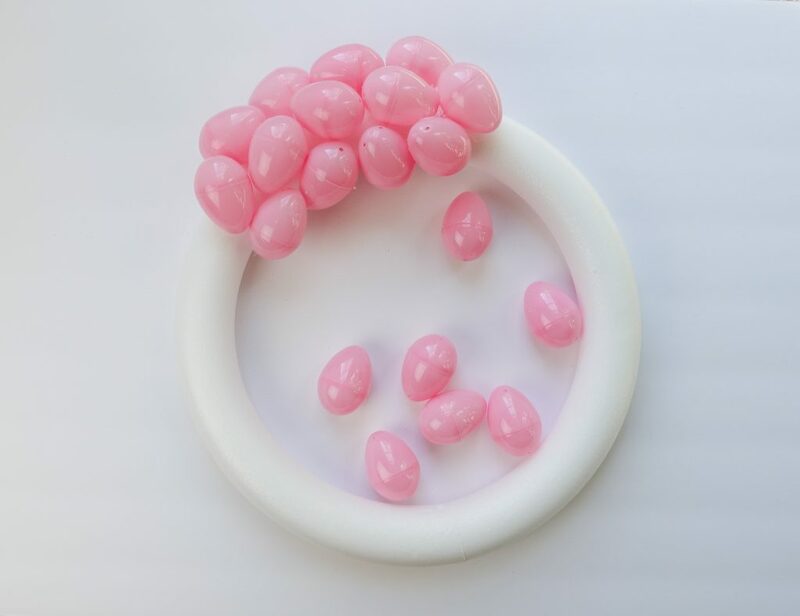 We found this white foam 14″ wreath in the craft section at Walmart. You can find similar ones at your local craft store. 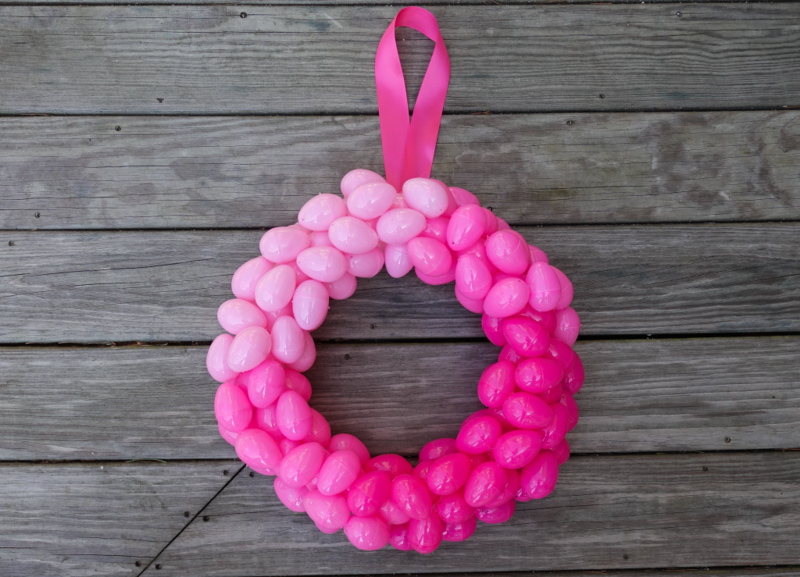 Keep in mind that you can create this Easter egg wreath using any color combination of easter eggs. 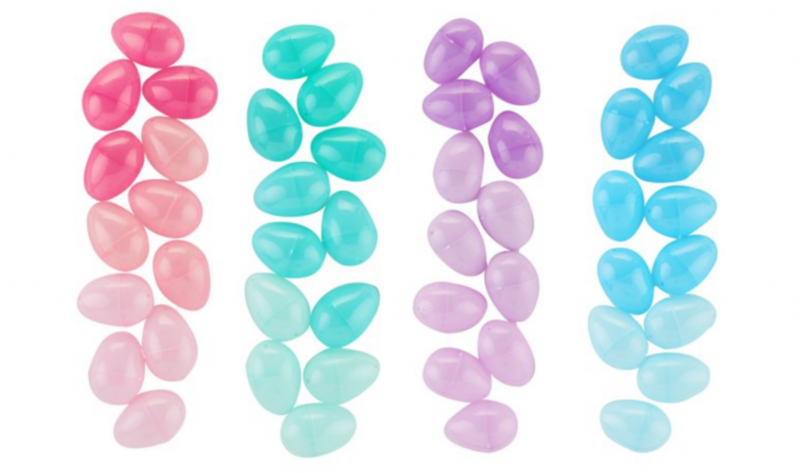 We found these sleeves of ombre Easter eggs in Pink, Blue, Purple & Teal in the holiday section at Walmart. 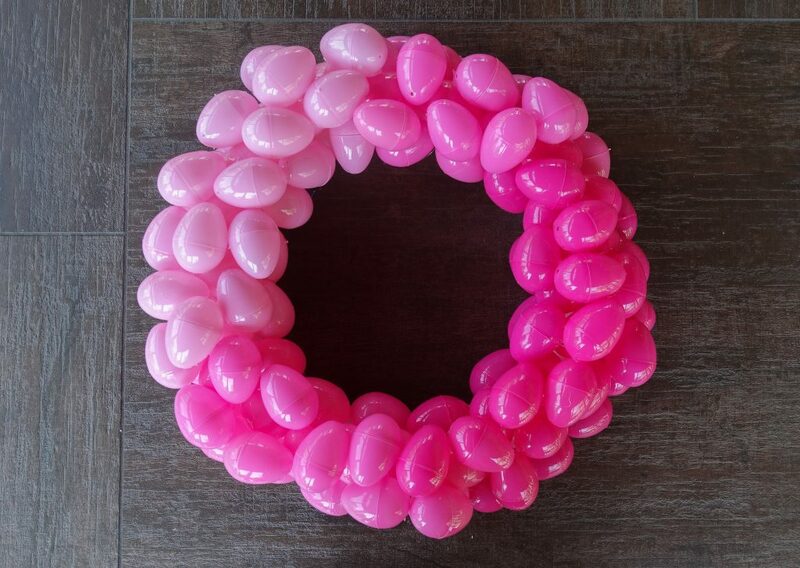 To complete our 14″ wreath we used about 10 sleeves or 120 eggs BUT you could very easily create this with less eggs. I wanted a very full look to the wreath so i did a few layers making sure to cover up most of the white space. These sleeves were less than $1 for 12 eggs. There were also larger bags of eggs in a variety of colors that would make it a lot cheaper if you didn’t mind having a variety of colors. Make sure that you have quite a few extra glue sticks on hand. I flew through about half of a package glueing all of the eggs. Start with the lightest color of eggs. Begin glueing them to about one third of the “top” of the wreath. Turn the eggs different directions trying to fill in as much of the space as you can. Add your medium shade eggs on either side of your light colored eggs covering the second third of the wreath. Then add your dark shade of eggs to the remaining third of the wreath. 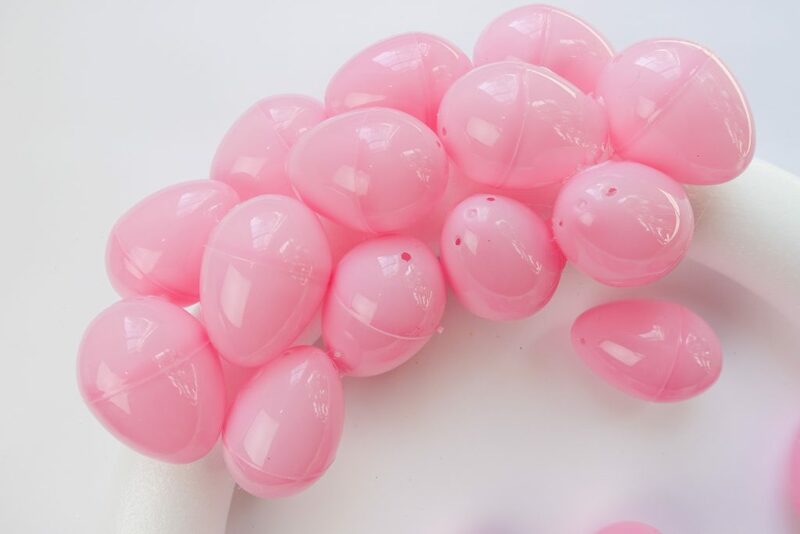 Continue layering the eggs until you get your desired look. Make sure that you have a few of them overlap sections so it appears as if the colors are blending together more. Make sure that you pick it up and look at it as if it were hanging. Sometimes you notice bare spots that you didn’t see before . Once you are done, twist the wreath around so the lightest shade is in the top left corner. Cut a section of your ribbon off and create a loop.